I've had a few Poljots, (and some Vostoks). Not bad watches, overpriced at a lot of their sales site, but not bad at all. Biggest issue I have in with them is parts, you cn;t easily get parts for them here in Canada. Originally, the Soviet government bought the defunct Ansonia Clock Company of Brooklyn, New York in 1929, and the Dueber-Hampden Watch Company of Canton, Ohio. It moved twenty-eight freight cars full of machinery and parts from the USA to Moscow in order to establish the factory. They later bought up old Swiss manufacturing lines, and that gave them more modern movements. Their chornos are decent, being based on an older Valjoux movement.. I've been lusting after one of those Buran's for months. I got my Poljot Chrono (same movement as the buran I believe)for just over $100. I love those Buran faces and cases though. And I agree, new they are definitely overpriced new, but usually a steal on e-bay, as long as you're not after a chronograph. My 1967 model 218 (2180 variant) Accutron. I'll post Seiko pics once I actually take them. Maybe one or two of my interesting (albeit) quartz machines too. And - as always, I have a few things in the works. A question for you Harold (and others familiar with Accutrons). When the Stem is full depressed, it still seems to catch the gearing on the watch - I could set it without pulling out the stem, and over the course of the day the stem will slowly turn (with the movement, obviously). I'm assuming that at some point in its life it was fitted with an incorrect stem - or just incorrectly fitted. But I wanted to make sure that was not normal behaviour before I took it in. I've never noticed mine doing that, but the one I had at the shop (the minute and hour hands never advanced with the movement) would change the date without pulling the stem. 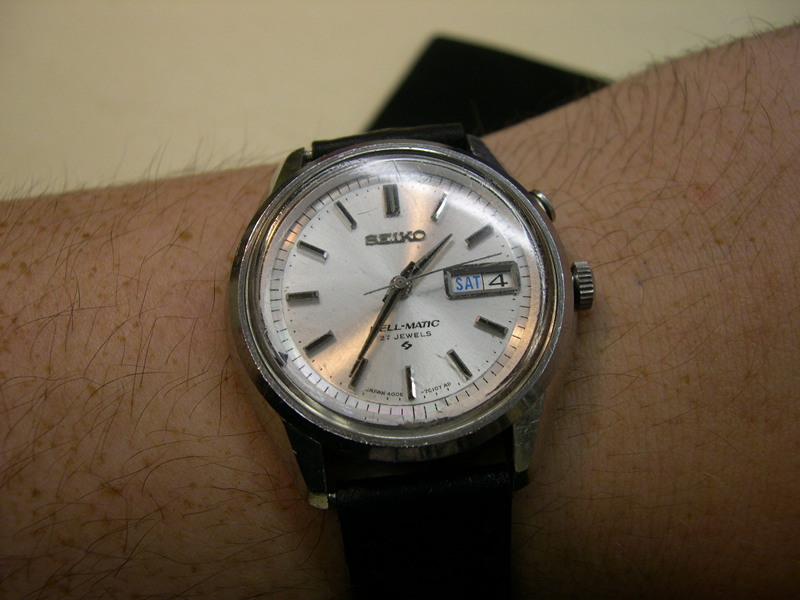 Harold, do you have one of the seiko spring drives? I'm really curious about them. Hate to bump.. but I'm doing this anyway. Itching to get this 218 in wearable condition. One thing that can happen is that when someone removed and replaced the stem, they did it wrong. To remove the stem on a 218, you must first pull the stem out to the setting position, then loosen the stem retaining screw, then pull the stem out. To replace the stem, its very importatnt that the setting works still be in the steiing position, as they were when you removed the stem. You indert the stem being carefull NOT to push it past the setting position, then tighten the retaining screw. The stem can then be pushed into the normal position. If you don't do it like properly, and if you dont; know Accutrons, its easy to do incorrectly, (as its a different stem removal procedure from most watches), then the watch muts be dissasembled, and the setting mechanism put back into its proepr alignment. Accutrons change the date without pulling out the stem. With the stem fully in, you trun the stem clockwise, you will feel a bit of resistance at some pijt, and then the date will click over. If the hands don;t move while the watch is running, it could mean a bad index wheel, or the finger pawls are out of adjustment and not contacting the index wheel..
As for Spring Drives, no , I donl;t have one, quite expensive and hard to get over here..
Accutrons scare me too! I can change the battery, and I can remove and replace the movement by myself, but to really work on them you need to almost be a neruosurgeon. My watch guy has all the Bulova factory equipment for Accutrons, and their shop was the Buloav approved Accutron Servcie Center for Alberta, but ahy watch that requires a 15X stereo microscope to work on, is out of my league..
-The index wheel of a 218 movement is 2.40mm (0.095") in diameter and has 320 teeth, each of which is about 0.01mm high (0.0004") and 0.02mm (0.0008") wide. The index and pawl jewels are perfect little square blocks of synthetic ruby, 0.18mm (0.007") square and 0.06mm (0.002) thick. How these parts were manufactured has remained a closely-guarded secret. -Each Accutron coil has 8,100 turns of insulated copper wire of 0.015mm diameter (or about 1/2000th of an inch). That equates to about 80 meters (or nearly 90 yards) per coil. The wire is about one-third the thickness of a human hair. - Power from the battery flows through the transistor, and then through both of the driving coils. One of the coils (the one which is attached to the plate holding the transistor and its components) also has a secondary coil built into it. When the fork springs one way, this secondary coil provides a feedback voltage which cause the transistor to almost stop the flow of current in the driving coils, and stop driving the fork. When the fork springs back the other way, this feedback coil generates a "reverse" voltage, which causes the transistor to allow current to flow in the driving coils again. The fluctuating current in the driving coils produces a varying magnetic field, which alternately attracts and repels the tuning fork magnets. Thus it keeps on vibrating. The system is self-regulating. If the watch receives a jolt which adds to the fork vibration, the circuit automatically reduces power to the fork until it reaches the normal amplitude of vibration. The reverse is also true. This mechanism provides the means for converting the vibrations of the tuning fork into rotary motion. Even today, it is considered a truly remarkable engineering accomplishment. Though the dimensions of the working parts are incredibly small, the operation of the index mechanism is elegantly simple, and its robustness and reliability legendary. Neverthless, it is very delicate and requires special handling techniques during servicing and adjustment. The index wheel can be destroyed by simply touching it on its rim. It must be handled by its pinion only. It consist of two very fine flat springs (or "fingers"), each with a small ruby jewel cemented with epoxy onto one end. 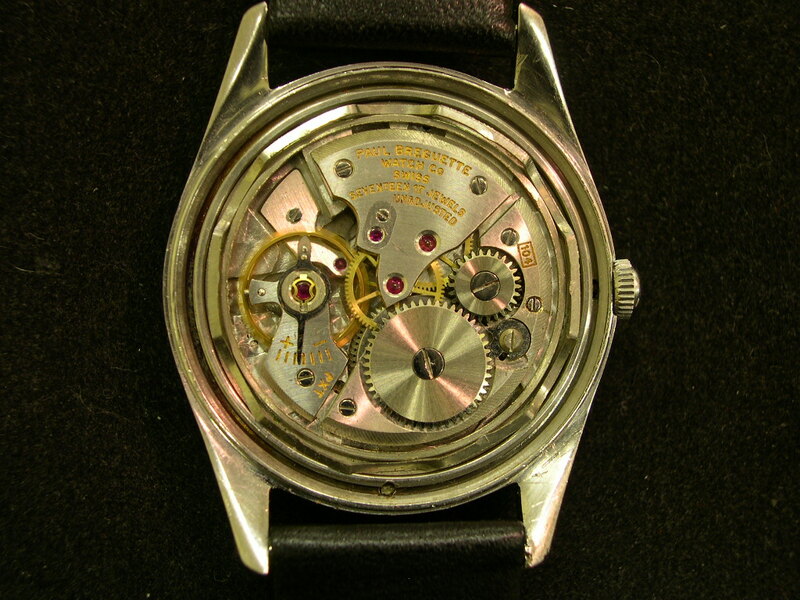 One of the springs (the pawl finger) is attached to the body of the watch by a small movable carrier and post. The other (the index finger) is attached to a post mounted on one arm of the tuning fork. The jewels of each finger rest on a special ratchet wheel (the index wheel) which has very small triangular shaped teeth. These teeth are so small, they cannot be seen without the aid of a microscope.The positions of the index and pawl jewels relative to each other is adjusted by moving the pawl jewel carrier. Correct adjustment is necessary to allow for variations in fork amplitude during the life of the battery. This is known as "phasing" the index mechanism, and requires good watchmaking skills, experience on Accutrons, and a good understanding of the operation of the index mechanism to be carried out correctly. In operation, when the fork moves towards the index wheel, the index jewel pushes the wheel around slightly more than one tooth. The wheel is then locked in place by the pawl jewel, so when the fork and index jewel moves back away, the index wheel stays stationary. This occurs once for every vibration of the fork, or 360 times a second for a 214 or 218 Accutron movement. 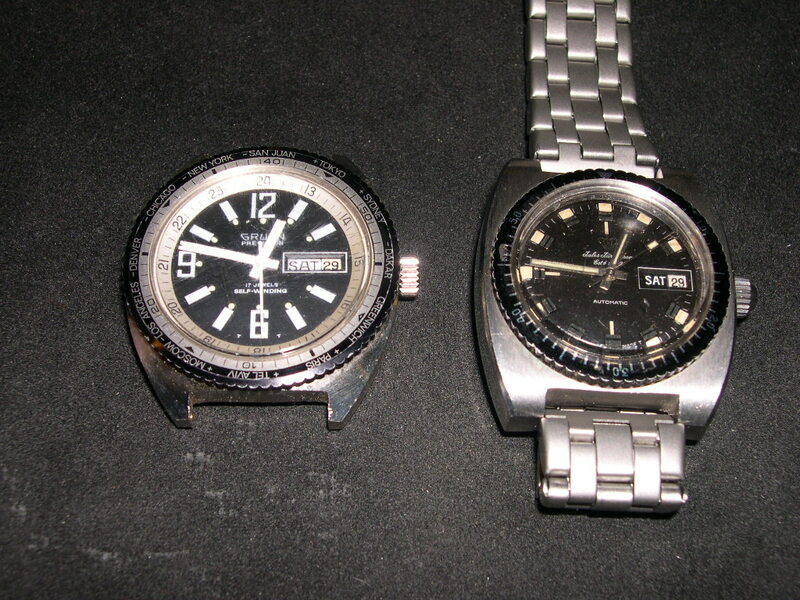 The only slightly interesting wristwatches I have are a couple of Vostoks - one manual wind, the other automatic. I wore the automatic one daily until it stopped and refused to continue. Winding and shaking will make it run for about ten to twenty seconds, but it just stops again after that. Any ideas? I should mention that I have little or no experience of watch repairs, but I've been repairing and maintaining model railway items since I was about five years old so tiny mechanisms aren't a problem. I just don't want to wade into it only to find it's not fixable. Just like anything, it's probably a case of a clean and a lube. You're probably right - it ran for about two or three years before expiring. I need to work out how to remove the stem so I can remove the mechanism from the casing for further exploration. My watch is not vintage, but I like it. I looked at this bad boy under th stereoscope at work and it was pretty amazing. Is there a web site that sell jeweler's tools at reasonable prices? I'm looking for ultrafine needles, probes, and pliers. Once you've got the back off, there should be a little screw of stud or button thing. Unscrewing this a few turns, or pressing it in'll release the stem, so that you can pull it out. Thanks, Harold... it looks like I'm going shopping. Ok, yet another question for ya Harold. I really appreciate the help. I've decided that reluming/ refinishing the dials is out of my price range for now, but that site www.ofrei.com has luminous hands for quite cheap. How might I go about measuring the diameter of the hole of the hands of my watch? I'm thinking I could take them off the watch, slide them down a file/awl ten measure the diameter that it slides down to. I'm afraid I might damage the hands (I'd like to keep the originals) and I don't think that method would work for the second hand which has a diameter around .2mm . Any tips? 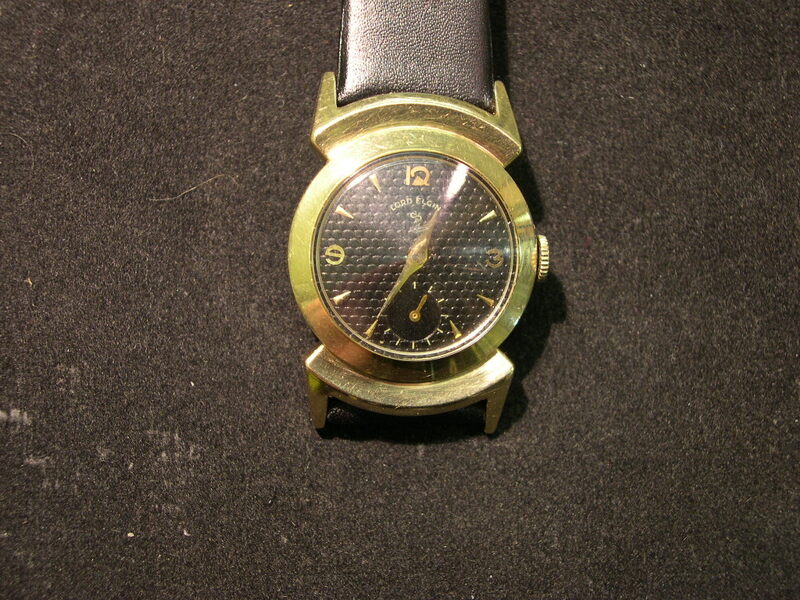 Its a Movado cal C221A if that helps. I found some data on it, but nothing as specific as shaft sizes for hands. Bergeron Hand Hole Guage - can mresure hand hole size and hand length. I've got like 3 in the drawers, I just didn't know what they were. Thanks! Incidentally, I have broaches and a hand holder as well. I'll see how many I've got and what condition they're in. I think one of them is in the box marked " Tools" and another is in one of the drawers of tools I actually use, though I've yet to use it since I was unaware of it's use. I don't know if anyone remembers this thread is down here. 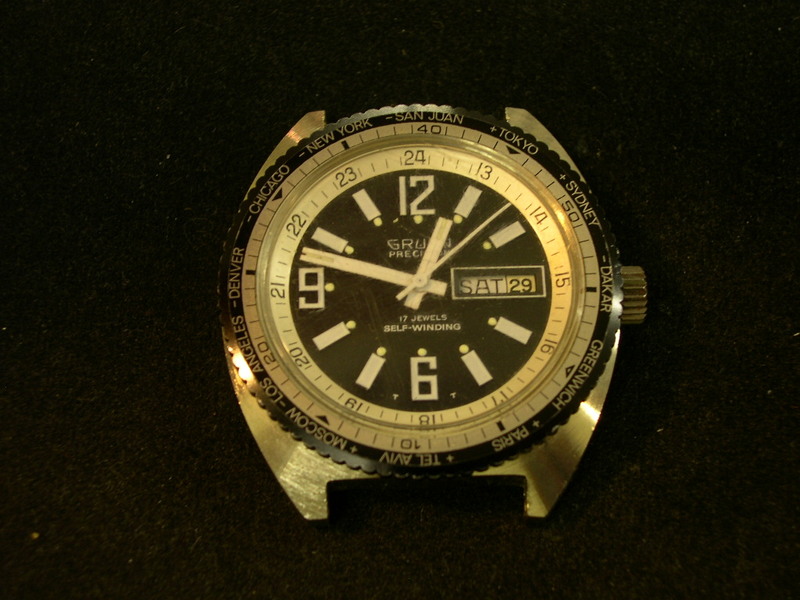 Wrist watch restorers - what do you recommend for cleaning up melted/degraded rubber gaskets. 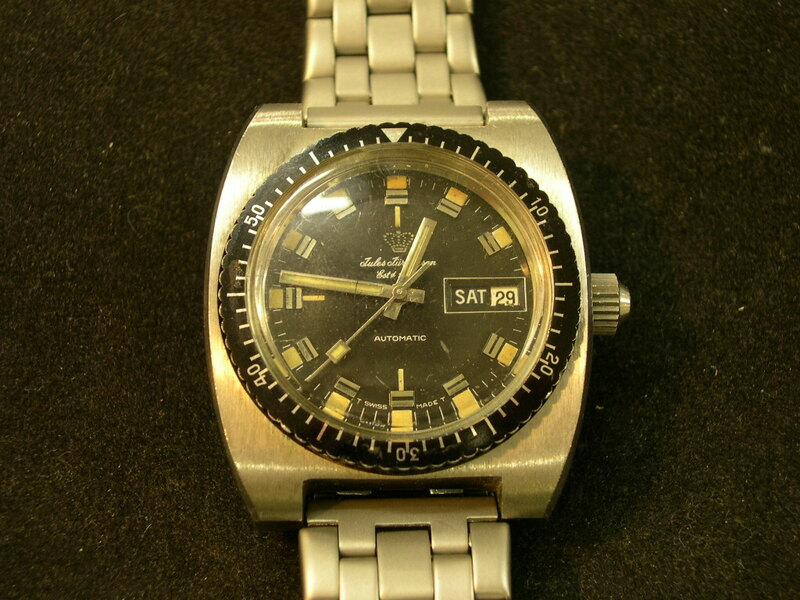 In particular - the front gasket on my 1975 Seamaster has melted onto the bezel and dial/face a bit. Mechanically - no issues, but I'd rather not muck up the dial while trying to clean it off. 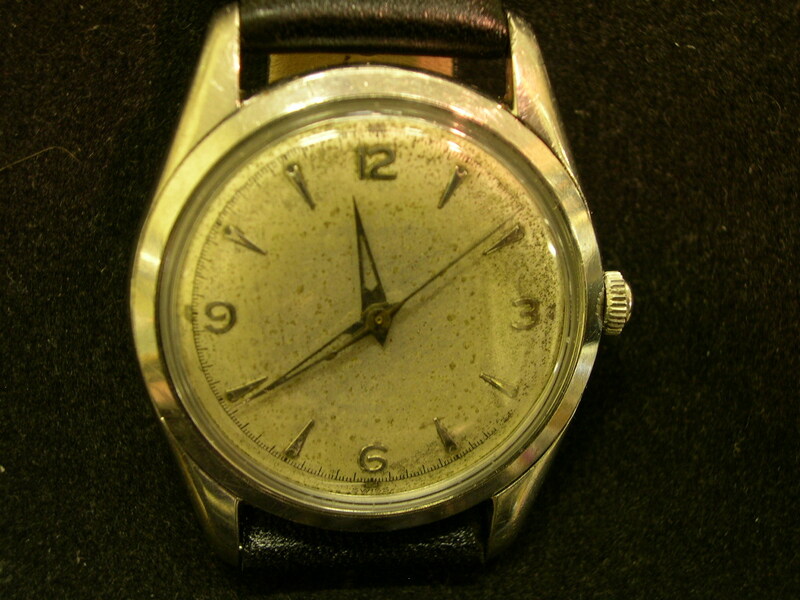 (I was afraid, for instance, that Acetone would harm the finish on the dial). Harold mentioned earlier, and I can attest to its effectiveness, that a camel hair brush will take a good deal of funk off a soiled dial. The gruen was running fine, just had to replace the hands. 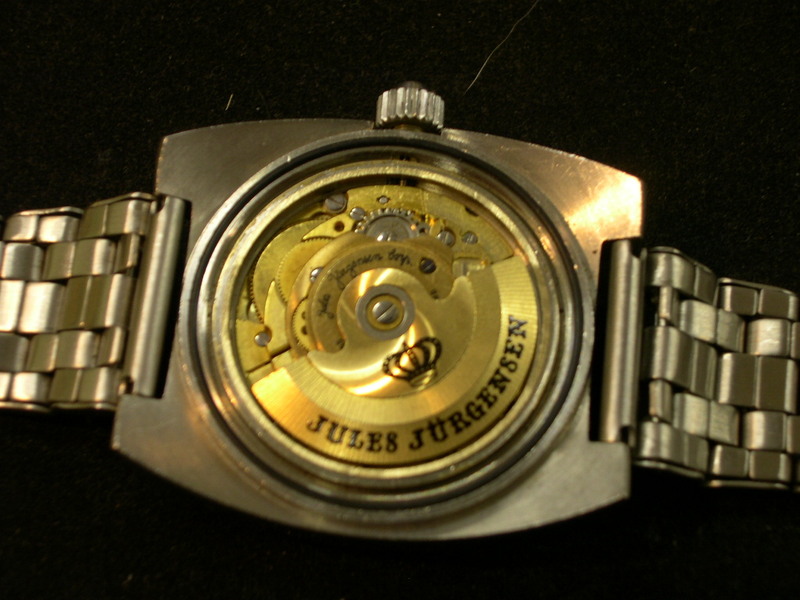 The Jules Jurgensen is another where I have an intact movement and hands w/ stem and crown, and even a case back, but no case. Quite frustrating, so It’s in some random case. I also had to fix the stem setting. It was stuck in the setting position. After removing the face, I was able to get it back to normal. The Day wheel is still a bit sketchy though, we'll see what happens at midnight tonight.